The second-generation Jaguar XF gets most things right on paper – lower weight, new engine, significant updates and a new design. But just how good is it to drive? The first-generation Jaguar XF had a lot riding on its shoulders, especially with the uncertainty of its ownership under Ford. Despite the pressure, and Tata taking control, Jaguar managed to turn out a modern and cutting edge product at the time. The new generation XF once again faces similar challenges – this time from its rivals. By the time this article appears in print, Mercedes-Benz would have launched the new E-Class, while BMW is expected to bring in the new 5 Series in a few months time. Does the new Jaguar XF have what it takes, then, to hold off this onslaught from the mighty Germans? At first glance, it might be difficult to distinguish the new XF from its older model – or, for that matter, from its siblings (the XE and XJ). But while the overall silhouette remains more or less the same, the changes are evident if you look closely. The headlights get the typical J-shaped Daytime Running Lights, while the LED taillights borrow its design from the F-Type. The sharp creases on the low-slung bonnet and the svelte tail section add character to the XF’s design. Jaguar sells the XF in three variants – Pure, Portfolio and Prestige. The one we had on test was the base Pure variant, which came fitted with rather ordinary looking 17-inch alloys. That being said, the sporty black grille of the Pure trim appealed to us much more than the chrome of the Prestige variant. The new XF looks typically Jaguar, and is quite the looker – even if you can’t immediately distinguish it from its siblings. The story on the inside is somewhat similar too. Some of the elements, like the rotary gear knob and the automatic opening side air vents, remain. Taking centre-stage in this Pure trim is an 8-inch touchscreen infotainment system with Jag’s new InControl interface. The infotainment system is user-friendly, responds well to touch inputs and comes with an 80W 8-speaker system. In the instrument cluster, the new Jaguar XF gets analogue dials with a full colour central TFT-LCD display. The top-end Portfolio trim, on the other hand, gets a fully digital TFT display. Other standard equipment on this base variant include 10-way electric front seats, dual-zone climate control, an electric sunblind for the rear windscreen, cruise control, and more. Standard safety features include Emergency Brake Assist, Dynamic Stability Control & Traction Control, hazard lights under heavy braking, as well as a front and rear parking aid. The all-black dashboard, meanwhile, doesn’t look as premium as you would expect from a car in this class and the steering wheel had a few too many buttons for my liking. But if it’s space that you’re after, there’s plenty of it. While the new XF is marginally shorter than its predecessor, it has far more space on the inside thanks to a wheelbase that’s 51mm longer. Under its curvaceous bonnet, the XF has received a heart transplant. With the XF, Jaguar debuts its new 2.0-litre Ingenium diesel motor that churns out 177bhp and 430Nm of torque. 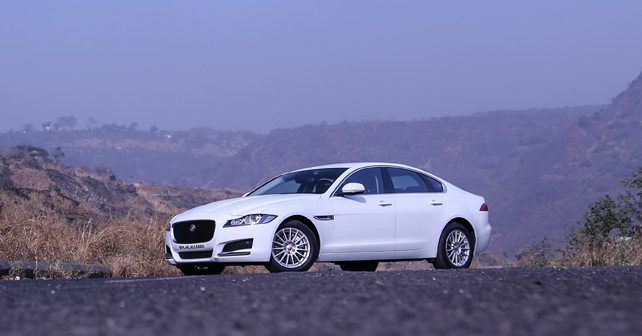 In comparison to its predecessor, the XF makes extensive use of aluminium thanks to which it sheds up to 190kgs. Needless to say, the reduction in weight does reflect in the way it accelerates from a standstill. The new engine is also relatively refined. That being said, at higher speeds, it does feel a bit rough around the edges – with a little bit of noise seeping into the cabin. When cruising, however, it doesn’t feel as coarse. The XF comes mated to an 8-speed automatic transmission. And while gearshifts are swift and smooth, they’re not quite as precise as the dual-clutch box in the Audi A6. Slotting the rotary controller in Sport, however, does make the shifts a little faster. The XF comes with Eco, Standard, Dynamic and Rain/Snow/Ice modes. Shifting between these modes adjusts the engine, gearbox and steering response. The Dynamic mode is the most enthusiastic of the lot – it not only makes the engine and gearbox more responsive, but also adds adequate weight to the steering. In comparison, all other modes feel soft and comfort oriented. The double wishbone setup in front and integral link at the back means that the new XF is now the best handling car in its class. In fact, with its rear-wheel drive setup, low weight, and sharp handling, it displaces the BMW 5 Series as the driver’s car in this segment. The steering is sharp and nicely weighted, the chassis is balanced, and it provides a great deal of confidence from behind the wheel. It’ll even let you indulge in some good old-fashioned hooliganism if you’re so inclined. With its latest generation of cars, it seems that Jaguar is certainly aiming for class-leading sporting prowess while, at the same time, being able to maintain the plush ride for which its always been famous. In our conditions, however, it does tend to bottom out on occasion when the going really gets rough. So if you want a luxury car that you can actually enjoy driving, this is the one for you. Plus, it stands out from the German competition. The new E-Class from Mercedes and 5 Series from BMW will give Jaguar some sleepless nights though. X-Factor: While the XF adds some punch in most areas, it’s not quite distinctive enough on the road. Great from behind the wheel though!